HyperSnap 8 is the fastest and easiest way to take screen captures from Windows screen. 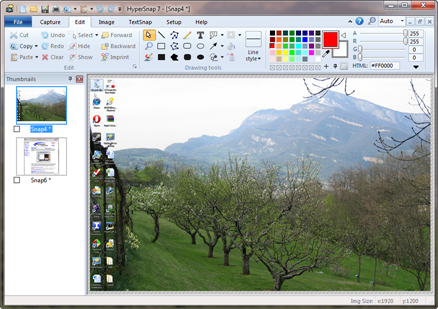 HyperSnap combines the power of a first-class screen capture application with an advanced image editing utility - wrapped into one easy-to-use tool. Now compatible Windows 10 desktop mode. HyperSnap 7 on Windows 7 - click image to see in full size. HyperSnap is perfect for capturing images and texts that you want to include in your Help system, online tutorials, manuals, training handouts, presentations, marketing materials, Web pages, emails and more. Use HyperSnap to quickly share a picture-perfect representation of anything on your screen. Current release: HyperSnap™ v. 8.16.10 Read "What's new in version 8"
HyperCam™ is powerful video capture software that records AVI movies (screencam) directly from your monitor, for software presentations, software training, demos, tutorials, and fun! HyperCam supports text annotations, sound, and screen notes (great for creating automated software demos!). You can also select Frame rate and compression quality prior to video capture. Compatible with 32 bit and 64 bit releases of Windows 8, Windows 7, Vista, XP, 2000. Current Release: HyperCam™ Ver. 2.29.00 Now completely free for world-wide use. Free and now unsupported product, find out more about it here. @Voice Aloud Reader is reviewed on Appliv! TTS+ Plugin for FBReader is reviewed on Appliv!